Sure, there are bargains to be had, but there are also plenty of pitfalls awaiting anyone brave enough to wade into real estate's maelstrom. Here's what to consider. NEW YORK (CNNMoney.com) -- Hoping to score a house on the cheap by buying a foreclosed property? There are good deals out there, but the process is complicated and risky. Here's what you need to know. There are certainly plenty of foreclosed homes on the market. In California, 40% of existing homes sold in the second quarter were foreclosures, according to DataQuick, a provider of real estate information, compared with 5.4% a year earlier. 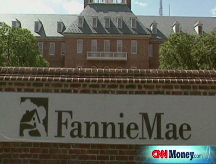 Indeed, Fannie Mae CEO Daniel Mudd said Friday that the company is pushing hard to sell more foreclosed properties, to get them off the books. "I don't think this is a time to be holding onto REOs and hoping for a better day," he said. There are three different stages of foreclosure, each of which presents different opportunities for buyers. The first step is to figure out which one makes the most sense for you. A home goes into pre-foreclosure when a borrower has fallen behind on his payments, but the house has yet to be auctioned off. Buyers can find pre-foreclosures by poring over the delinquency notices that lenders file with county courthouses when a borrower misses a payment. Armed with prospects, buyers should go scouting. If they see homes they like, they should contact the owners to see if they want to sell. "You call them or knock on their doors and say, 'I know you're having a problem and I think I can help you,' " said Alexis McGee, co-founder of Foreclosures.com. McGee only buys when she figures she can make a profit of 30% or more; marketing and other expenses wipe out about half that by the time she resells. But people buying a house to live in might be happy with a 20% discount from market value. Cold calling and making low-ball offers on people's homes can be difficult: Some owners are emotional, even angry. Many are trying to hold onto their houses and don't appreciate what they consider scavengers sniffing around. "But you're not taking advantage of these homeowners," said Duane LeGate, president of HouseBuyerNetwork.com, which puts together buyers and sellers of distressed properties. "All many of them want is financial relief from bad mortgages, and you're offering it." Indeed, some owners are open to doing what's called a short sale, which is when a buyer pays less for a house than the mortgage that is owed on it. Lenders must agree to a short sale, and will then forgive the rest of the debt. Often, banks are reluctant to do such deals, since it requires them to take a loss. It can take months and a lot of badgering before a deal goes through, and not every buyer is up for that kind of hassle. But as the housing market deteriorates, lenders are warming up to short sales, according to Foreclosure.com founder Brad Geisen. "It makes a lot more financial sense for them to liquidate early rather than go through the foreclosure process," he said, which can cost lenders about $50,000. Gabe Cera recently bought one through an associate of LeGate, Raul Pineyro, owner of Cacophony Group Real Estate Services in Dade County, Fla. Cera purchased a four-bed, three-bath in Miami for about $60,000 less than what the owner's mortgage was worth. "I'm very satisfied," Cera said. "The transaction was very smooth and quick and I think I saved a lot of money." In buying any pre-foreclosure, LeGate advises buyers to not be turned off by dirty carpets or ugly paint jobs. That's where the best deals are. "Anybody can go the Home Depot (HD, Fortune 500) and buy some paint and a new rug," he said. In the next stage of foreclosure, homes in default are auctioned off on the county courthouse steps. These homes can be real bargains, but the process is a crap shoot. Bidders can't inspect the property, so there's no telling how much work it needs. And there is also no telling what kind of liens there are against the home, due to unpaid taxes and so forth, which can also jack up the cost of these homes. Finally, Buyers need to come with cash, ready to put 10%-20% down on the spot, and able to pony up the rest in a matter of days. "If you want to buy on the courthouse steps," said LeGate, "you'd better be a pro." Even after a purchase, a deal can fall through if the current owner can come up with enough cash to repay the buyer the amount of the winning bid. LeGate himself has bought several homes at auction, with mixed results. "The first time, I bought, renovated and sold the house all within 29 days and made a killing," he said. "I thought I was a mini-Donald Trump. The second time, the previous owner poured cement into the pipes before he left and when I turned on the water, it clogged everything. I lost more on the second house than I made on the first." After a lender takes back a house, the property goes back on the market as what's called an REO (real estate owned) property. These are treated like ordinary sales, listed with a broker. Typically, bargains are not as sharp. Author Steve Dexter advises house hunters to go to the Web sites of all the major lenders and look for REOs in their communities. Alternatively, "Get a young, hungry real estate agent who's screening REOs all the time and put them to work for you," he said. Foreclosures for sale may also be found on the sites of Freddie Mac (FRE, Fortune 500) and Fannie Mae (FNM, Fortune 500), as well as eBay (EBAY, Fortune 500). Dexter prefers to buy REOs because the process is so clean; the title is clear and the property is delivered vacant, even if the prices aren't as good. He says one bank manager told him he usually sells REOs for 95% of listing prices, on average. "You might not think that's too great for buyers," said Dexter, "but the listing prices are lower [than market value]," usually by 10% or more. The total discounts often exceed 15%. Another way to buy an REO is through an REO auction. As bank portfolios of these properties have swollen, they've started to unload them en masse. Pam McKissick, chief operating officer of Williams & Williams, an auction company based in Tulsa, said her company buys big portfolios of post-foreclosure properties from lenders and then auctions them to individual buyers. The REOs that Williams & Williams pick up are usually sold within 30 days; successful bids can be quite low. "It's a very rapid process," said McKissick, " You want to put a family back into a home quickly and bring the neighborhood back. This does that."